On New Year's 1792 a new play loosely based on the Soga brothers theme debuted in Edo. It appears to have caught the imagination of its audience and many artists over the next few decades. Sadly, we don't know what the exact subject was, but we do know the name, Waka Murasaki Edokko Soga or 'Pale Purple Soga, Edo Style' (若紫江戸子曽我). 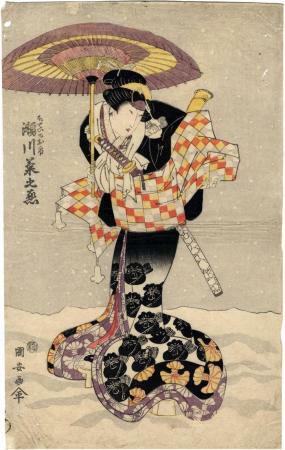 Visually one of the most appealing elements was the inclusion of a group of onnagata as the female counterparts to the so-called '5 chivalrous men'. Above are a number of links which correspond to this print in the Lyon Collection, but are from different years and different artists. Kabuki21 reports that Hotei no Oichi is one of five aliases of the female thief Hanaoka. The Segawa Kikunojō crest of a bundle of silk floss, the yuiwata, is prominently displayed in two areas at the bottom of the actor's robes. On the purple robe it is left in reserve while on the black one it is printed in yellow as if it were golden. The scabbard of the sword is decorated in what the Chinese called the 'cracked ice' motif.